Jesse Biddle pitches in a Reading game on May 9, 2013. 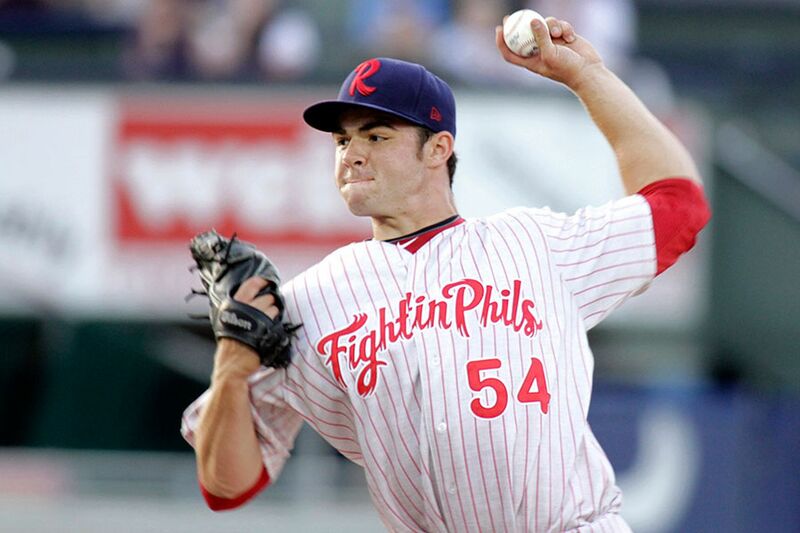 Jesse Biddle, the Germantown Friends graduate and former first-round pick, was designated for assignment Friday by the Phillies in a transaction that could end the lefty's once-promising time with his hometown team. The Phillies replaced Biddle on the 40-man roster with a waiver claim - reliever Bobby LaFromboise, a 29-year-old lefthander with a 3.63 ERA in 27 career games. Biddle, 24, will miss the entire season after undergoing Tommy John surgery last October. The Phillies have 10 days to either trade, release or waive Biddle. If Biddle clears waivers, the Phillies could outright him to the minors so he remains in the organization while he recovers. His injury could deter any interested teams. The cost of a waiver claim is $20,000. Biddle has two minor-league options remaining. Saddled with high expectations since he was selected with the 27th overall pick in the 2010 draft, Biddle remains a mystery. At times, he confounded hitters with a low-90s fastball and a devastating curveball. But consistency has eluded Biddle, who has dealt with various injuries over the last three seasons. And, with a new front office, players are sometimes valued differently than before. The Phillies have made it a priority to acquire young pitching through trades, and those additions have pushed Biddle from top-prospect status to mere depth. But the Phillies have invested a great deal of time and money in Biddle, who signed for $1.16 million in 2010. He is lefthanded. He had stretches of dominance. Biddle posted a 3.82 ERA in 133 minor-league games. He reached triple-A Lehigh Valley last season and stumbled to a 6.25 ERA in nine starts, but the elbow trouble persisted all of last season. Before that, he was sidelined in previous seasons by whooping cough, a concussion and a quadriceps injury. LaFromboise enters the bullpen picture as another lefthanded option. He appeared in 11 games last season for Pittsburgh with a 1.13 ERA. This was the second time this winter that LaFromboise was claimed off waivers; the Angels claimed him in December from Pittsburgh.